As legal subdivisions of the state, California’s 58 counties play a key role in delivering public services at the local level. Counties operate an array of health and human services programs on behalf of the state, including foster care, public health and mental health services, and Medi-Cal (California’s Medicaid program). Counties also carry out a broad range of countywide functions, such as overseeing elections and operating, along with the courts and cities, the criminal justice system. Finally, counties provide some municipal-type services in unincorporated areas, including policing and fire protection. Each year, counties develop their budgets for the upcoming fiscal year through a months-long process that reflects both unique local practices and the requirements of state law. (The fiscal year runs from July 1 to the following June 30.) A key task in crafting the annual spending plan is estimating how much revenue the county will receive, since this number helps to determine whether the county can expand and/or improve service levels, as opposed to maintaining or (during economic downturns) reducing services. Statewide, counties received $69.2 billion in revenue in 2015-16. Nearly half (47.1%) of this revenue came from the state and federal governments, and local property taxes made up almost one-fifth (19.5%) of the total. Because state and federal dollars comprise a large share of county revenues — and typically come with strings attached — county budgets, to a large degree, reflect funding and policy choices made by the Governor and state legislators as well as by federal policymakers. However, county budgets also reflect local choices, as counties allocate their limited “discretionary” dollars, particularly property tax revenue, to locally determined priorities. 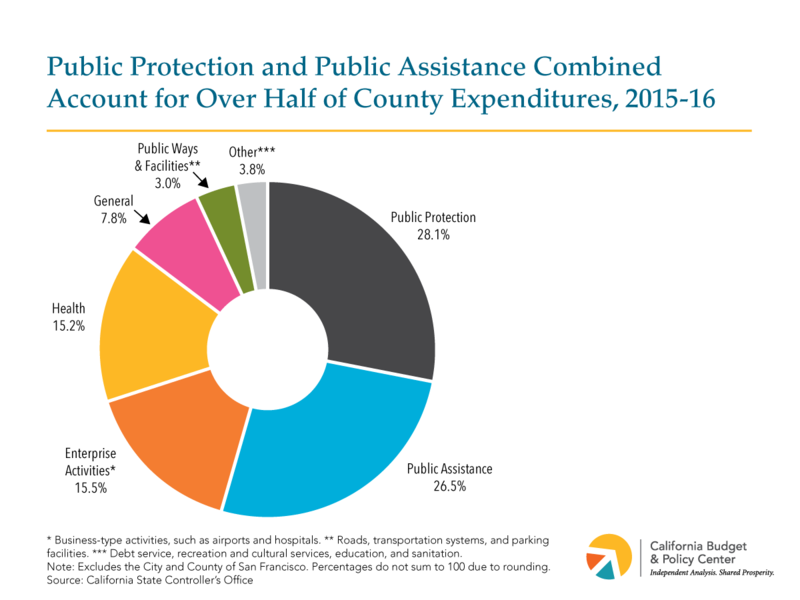 Statewide, counties spent $66.9 billion in 2015-16, with more than half (54.6%) of these dollars going to public protection or public assistance. Public protection includes spending on the district attorney, adult and juvenile detention, policing provided by sheriff’s departments, and probation. Public assistance includes spending on cash grants for Californians with low incomes, including for families with children in the CalWORKs welfare-to-work program. Large shares of county spending in 2015-16 also supported business-type “enterprise” activities (15.5%) — such as airports, hospitals, and golf courses — and health-related services (15.2%). 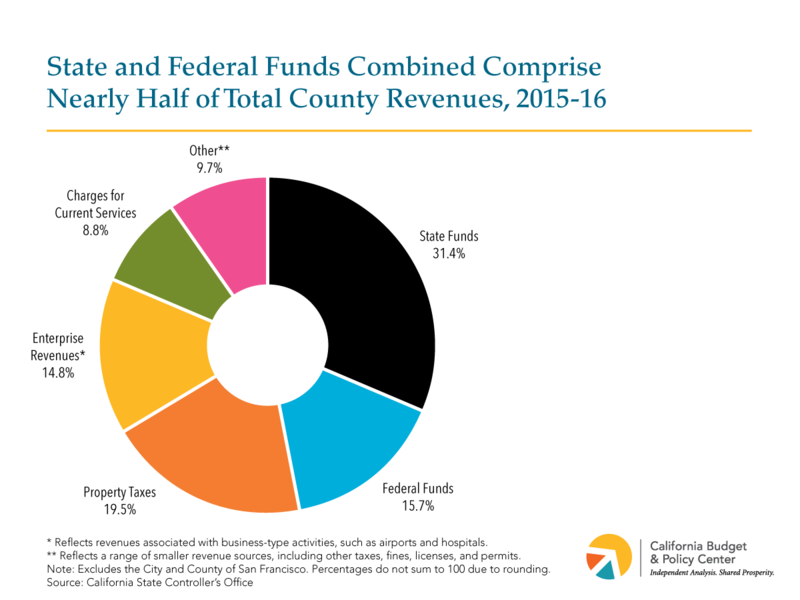 The county revenue and spending data reported in this Fact Sheet — for which 2015-16 is the most recent year available — come from the Local Government Financial Data website of the California State Controller’s Office. The figures exclude the City and County of San Francisco, which reports revenues and expenditures as a city rather than as a county.